Each year, the Law Society of Ontario awards the Law Society Medal to selected lawyers who have made a significant contribution to the profession. The award is given for outstanding service within the profession, whether in the area of practice, in the academic sphere, or in some other professional capacity where the service is in accordance with the highest ideals of the legal profession. It may be awarded for devotion to professional duties over a long term or for a single outstanding act of service. Called to the Bar in 1987, Lenny Abramowicz has committed his career to the Ontario community legal clinic system, starting with his articles in 1986 at the Parkdale Legal Clinic, and most recently as the Executive Director of the Association of Community Legal Clinics of Ontario. For the past 30 years, Mr. Abramowicz has worked tirelessly to promote access to justice and equality for low-income Ontarians. Called to the Bar in 1995, Kathleen Lickers, a Seneca from Six Nations of the Grand River, is widely recognized for her work in Indigenous affairs. She is renowned for her expert counsel and as an accomplished negotiator between Indigenous agencies, First Nation governments and federal and provincial ministries. Called to the Ontario Bar in 1987, the Newfoundland and Labrador Bar in 2015 and the Alberta Bar in 1965, John Olthuis has spent 40 years working with First Nations across Canada from Labrador to the Northwest Territories for recognition and implementation of their Aboriginal and Treaty Rights, including finding innovative ways to secure cultural and habitat protection and economic benefits from projects they consent to in their Traditional Territories. Called to the Bar in 1994, Gilles LeVasseur, a proud Franco-Ontarian, has dedicated much of his career to working to protect, promote and enhance the constitutional and language rights of Ontario’s Francophone community, including human rights. Called to the Bar in 1994, Carissima Mathen has championed women’s equality, respect for the rule of law and public legal education throughout her career. From her work on ground-breaking sexual violence cases, to her constitutional scholarship and informative public commentary, she has become one of Canada’s leading legal voices. Called to the Bar in 1973, Walter Traub is highly regarded as one of Canada’s foremost experts and authorities in real estate and mortgage law. He is the Editor in Chief of the leading book on mortgage law in Canada, “Falconbridge on Mortgages” published by Canada Law Book in 2003 and he has made a remarkable contribution to the law and practice of real estate through his role as a teacher, mentor, writer and leader in the real estate bar. Originally struck in 1985, the Law Society Medal has been awarded to more than 100 lawyers in recognition of distinguished service. 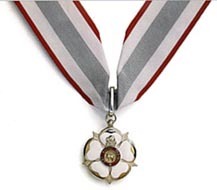 The Medal is made of sterling silver and is in the shape of a heraldic rose; the petals covered in white enamel. The white rose of York was chosen because it forms part of the Law Society’s coat of arms; it symbolizes the fact that the Law Society's seat was in York County, and that Toronto was called York at the time when Osgoode Hall was created in 1829. The Law Society's motto, "Let Right Prevail," appears in a red enamel circle in the centre of the rose, surrounded by a stag. The stag came originally from the coat of arms of Sir John Beverly Robinson, an early Treasurer. A beaver was also included as it appears in the Law Society's coat of arms. Recipients of the Medal are permitted to wear it on appropriate occasions, and can also use the designation LSM (short for Law Society Medal) after their names. See a list of all recipients of the Law Society Medal.